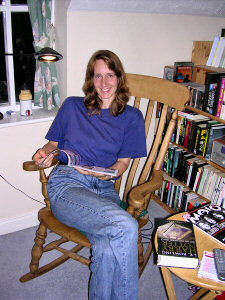 My sister Imke has just arrived for her annual visit to Wales. No, Swindon isn't in Wales, but on the way from Heathrow to the Cwmfforest Riding Centre in Talgarth, Brecon, Wales. Depending on the weather we'll either have a lazy morning at home and then I'll drive her to Wales in the afternoon or we'll leave earlier and stop somewhere on the way. Only slightly related (we went to Tesco earlier this evening for some shopping and that's where we noticed), but Christmas must be just around the corner: Christmas pudding, Stollen and advent calendars were for sale at Tesco already. And my sister got an early Christmas present, just to point out that the book in the picture has nothing to do with me. Anyway, she'll be horse trekking for the next week before I pick her up again next weekend. Plans for next weekend again depend on the weather. On the Monday she's off to London before flying back to Germany in the evening. Now you know everything you never wanted to know about my sister's visit. Blogging will be even lighter than usual tomorrow. Probably.